What's the deal with Lombard Street? The eight switch backs on the one block stretch of Lombard changes the 27 degrees grade to an easier-to-navigate 16 degrees. 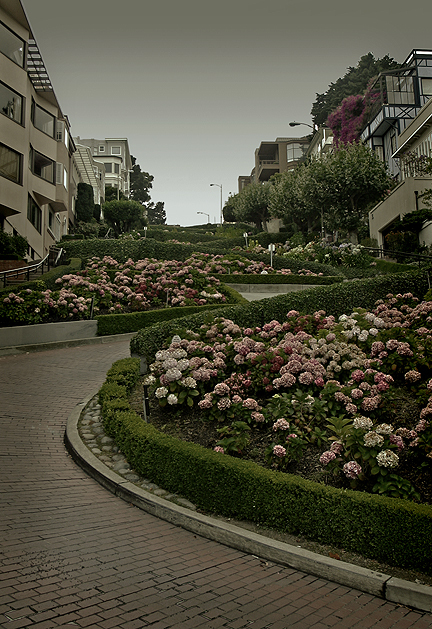 Guidebooks love to point out that Vermont Street in Potrero Hill is actually more crooked, but Lombard still owns the "crookedest street" fame due to its picturesque appeal. Those of a particular age may recognize the 'Real World, San Francisco' house in the top left.